The mulberry is a beautiful, ornamental tree. The fruits have a wonderful flavour and lots of sweet juice and t he limbs become crooked and gnarled as they age, making an attractive architectural feature. They can grow as high as 8–12 M (25–35 feet) but can be pruned and grown as a bush or an espalier. The trees can take from at least four years to six years to start producing fruit. 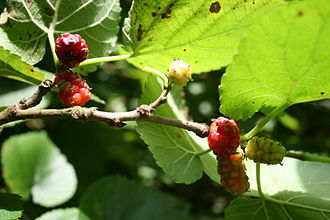 The black mulberry is generally grown for its fruit. The white variety does produce fruit, but smaller and much less sweet. Cultivation is similar to that of an apple tree. You can buy bare-rooted or pot grown trees. Plant bare rooted trees in late autumn/early winter, while the soil is still warm and the tree dormant; container grown trees may be planted at any time of year as long as the soil is not frozen or completely sodden. Mulberries are tolerant of most soils but prefer a moisture retentive but well-drained soil in a sunny, sheltered position. They can be successfully grown against a wall if space is limited. Dig a hole large enough to comfortably accommodate the depth and size of the roots, incorporate lots of well-rotted manure or compost, and water the tree in well after planting. Be careful not to damage the roots when planting, as they are quite brittle. Stake the tree to protect the tree from wind rock and encourage good root development. Remove any vegetation around the base of the tree and mulch well, to help keep in the moisture and discourage weeds growing and competing with the young tree. 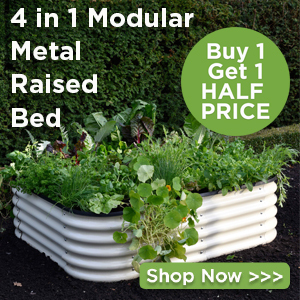 Apply a general purpose fertiliser in late winter and a mulch of organic matter or well-rotted manure in spring. Water and mulch in dry weather, particularly during the first couple of years – do not let a young tree dry out. Harvest August–September, as the fruits mature. Carefully pick the fruit once it has matured to a deep purple-red colour – they are sweetest when soft. Or lay old sheets beneath the tree as the fruits begin to ripen. Gently shake the branches to release the ripe fruit. Harvest mulberries with care as the fruits disintegrate easily. You may want to wear gloves to protect your hands from staining – mulberries give up their juice easily. Fairly trouble-free. The trees spread out as they age, and become brittle. Support the branches to avoid damage. If possible, net the tree as the fruit matures to prevent bird damage. Mulberries are self-fertile and there are several varieties available. Most delicious eaten fresh, straight from the tree, with the addition of cream or vanilla ice cream. Freeze mulberries in a single layer in a shallow tub and transfer to a container once frozen.